Getting around the Bay Area can be no sweat (literally) when you combine biking and transit for longer trips. The great news is that every local agency listed here offers some type of bike access, and for no additional charge beyond the regular ticket price! A combination of biking and transit is a great option for longer commutes. Never board with your bike on any crowded car. Use your good judgement to determine if you and your bike can fit comfortably and safely. If not, find a less crowded car or wait for the next train. Keep aisles and doorways clear for other passengers. Use the “bike space” on each car if possible, and stack bikes next to each other to conserve space. Yield space to pregnant, disabled, or elderly passengers. Be especially courteous to and respectful of your fellow passengers in general. Always maintain control of your bike while on board a train. 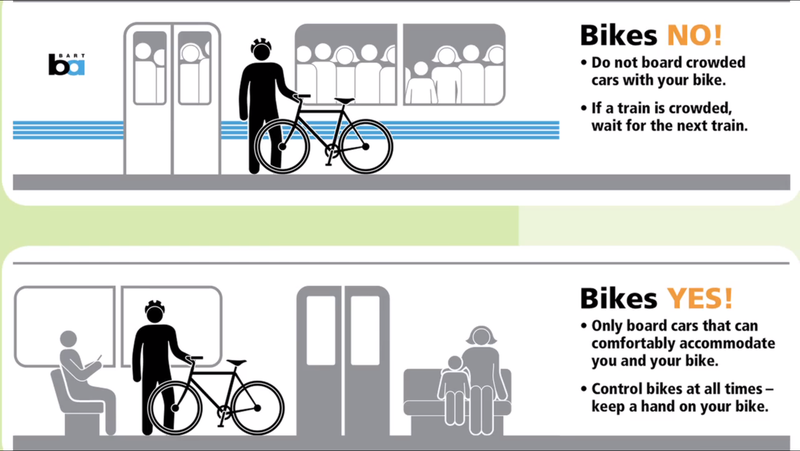 In case of an evacuation, leave your bicycle on the train and do not let it block aisles or doors. In addition, bicyclists must only use BART elevators or stairs, not escalators, and always walk their bikes inside a station. When entering or exiting a station use the wide fare gates (orange) to roll your bike through, and do not lift your bike over the narrow fare gates (red). A “beginner’s guide” with more tips and tricks for getting your bike on BART and through the stations is available here. AC Transit: Every AC Transit bus has space for two or three bikes with 16” or larger wheels via the front racks (watch the video below to see how they work). 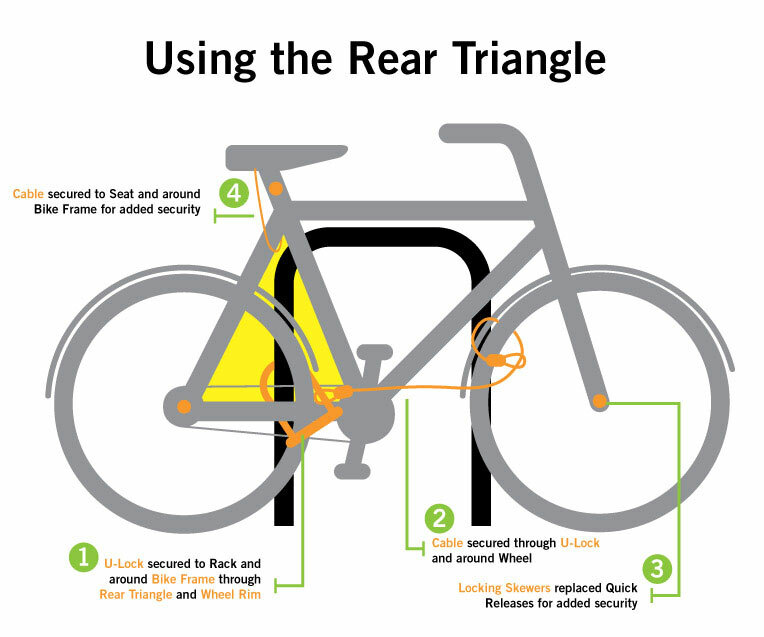 Keep an eye on your bike in the rack, however, as thieves have been known to just take a bike off and ride away. Locking your bike to the rack is not allowed, but you can lock your bike to itself (frame and wheel) before stowing it which makes it impossible to ride off with. If the front racks are full on a big, green commuter coach you can alternately ask the driver to open the cargo bay for you which can store two more bikes. Additionally, if between the hours of midnight and 5:30am on weekdays or midnight at 9am on weekends/holidays you are allowed to bring your bike on board a standard, two-door bus if the front racks are full and there is space on board. More details on the AC Transit bike policy can be found here and here. Amtrak Capitol Corridor: Just roll your bike on board these Sacramento to San Jose trains with stops at Martinez all the way down to Fremont. Buy tickets at the station or online to avoid additional surcharges, board on the car with the bike symbol next to the door, and be prepared to stand during the trip if all of the bike parking hooks are taken. If you do stow your bike on a hook make sure to lock it up and take any valuables with you to your seat. Capitol Corridor even has a bike specific newsletter, the Spoke ‘n Word. Altamont Corridor Express (ACE) Trains: Board via the door with a “Bike Car” sign affixed. Each bike car has 14 bike stalls with 2 additional stalls on the lower level. Secure your bike’s front wheel in the floor rack and secure with your lock or the provided velcro strap. Contra Costa County Connection Buses: Serves Central Contra Costa County. Each bus can accomodate two bicycles via front racks. Tri-Valley Wheels Buses: These Dublin/Pleasanton/Livermore buses can take two bikes each on the front racks, and inside the bus if space allows. Tri-Delta Transit: Serving East Contra Costa, all Tri Delta Transit buses can take two bikes each on the front racks. At the driver’s discretion, bikes may be allowed on the bus when the rack is full. If the driver determines that there are too many people on the bus, for safety reasons the driver will not permit bikes on board. WestCAT Buses: This West Contra Costa County transit service can accomodate two bikes each on the front racks. Alameda/Oakland Estuary Crossing Shuttle: This free shuttle takes passengers and bikes of all sizes from Lake Merritt BART to the College of Alameda and back during commute hours on weekdays. Additional transit operators include Union City Transit, the West Berkeley Shuttle, and various other shuttles which provide service from East Bay BART stations (many for free, and many of which provide bike access!). 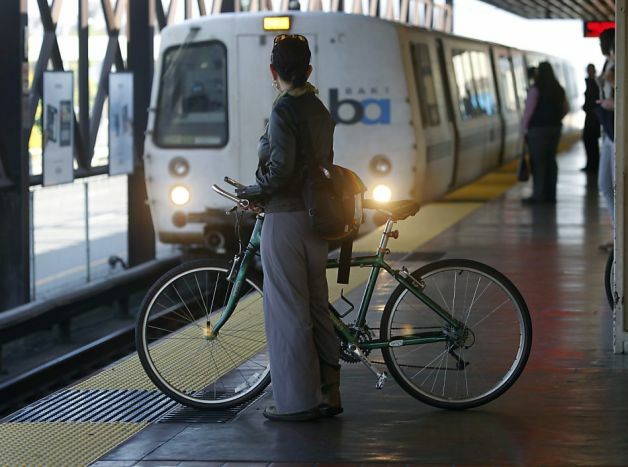 BART: As of July 1st, 2013, you can now take your bike on BART any time, even during the commute hours! Please review and adhere to BART’s bike access rules listed here, to ensure that the system remains bike-friendly. Oakland/Alameda/SF Ferry. This ferry allows passengers with bikes on board for no additional fee beyond the normal ticket price. Carry a bungee cord to secure your bike to the rear railing in case the provided bike racks are full. Ferry terminals are in Alameda at Harbor Bay and Main Street, in Oakland at Jack London Square, and in SF at Pier 41, the Ferry Building, AT&T Park, and South San Francisco. Caltrans Bay Bridge Bicycle Shuttle: This shuttle takes 14 riders and bikes at a time between MacArthur BART to the Transbay Terminal in San Francisco for just $1 each way. The shuttle runs both directions during commute hours only, is first-come first-served, and is only available to passengers with bikes. AC Transit: Every AC Transit transbay bus has space for two or three bikes with 16” or larger wheels via the front racks (watch the video above to see how they work). Keep an eye on your bike in the rack, however, as thieves have been known to just take a bike off and ride away. Locking your bike to the rack is not allowed, but you can lock your bike to itself (frame and wheel) before stowing it which makes it impossible to ride off with. If the front racks are full on a big, green commuter coach you can alternately ask the driver to open the cargo bay for you which can store two more bikes. Additionally, if between the hours of midnight and 5:30am on weekdays or midnight at 9am on weekends/holidays you are allowed to bring your bike on board a standard, two-door bus if the front racks are full and there is space on board. More details on the AC Transit bike policy can be found here and here. Amtrak Capitol Corridor Transbay Buses: Amtrak provides service from the Emeryville Station into San Francisco by charter bus. Bikes can be locked up at station racks or stowed in the bus luggage compartment (no charge) if there is room available. Please note: State law requires that trips booked on Amtrak include at least one segment where you travel by train (rather than just by bus), so you must also select at least one other segment of your trip where you travel by train, even if you do not use it. (Cheapest ticket is from Berkeley to SF). WestCAT Transbay Bus: This line runs from Hercules to the Transbay Terminal in San Francisco. Buses can accomodate two bikes each on the front racks. Sign up for a BikeLink card to get access to all the secure bike lockers and bike rooms all around the East Bay for just 3-5¢ per hour! 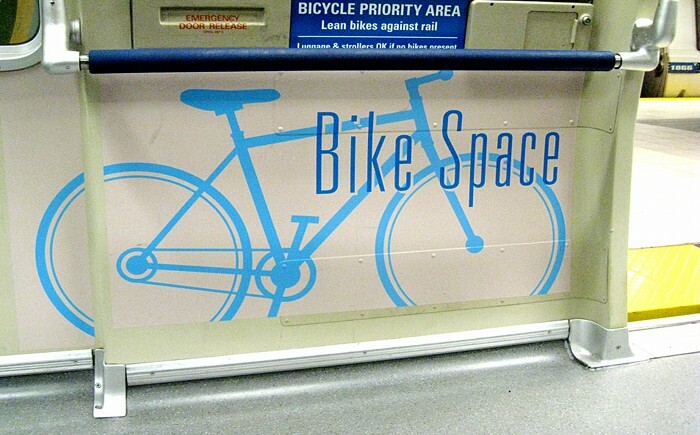 BikeLink offers secure bike rooms at the Ashby and Embarcadero BART stations, valet Bike Stations at Downtown Berkeley, 19th Street, and Fruitvale BART, and standalone lockers which can be found at almost every East Bay BART station. More lockers and rooms will be coming soon to East Bay Amtrak stations, and to BART stations at MacArthur, Concord, El Cerrito, Pleasant Hill, West Oakland, and Civic Center in SF. If you lock up outside make sure you do so securely. Use a quality U-lock and cable, and follow these instructions on our website. Reviewing the information on our New Cyclists page. Picking up a Bike East Bay map at your local bike shop, or one of the many free bike maps produced by cities around the East Bay. Mapping out your bike commute online at bicycling.511.org. Attending a free Bike East Bay Urban Cycling 101 class to get tips from certified instructors and free gear. Joining Bike East Bay to help create better biking conditions in the East Bay, and to get all the latest news on what’s happening in your city. Visit 511.org for more great alternatives to commuting solo by car, as well as updates on local transit services. Send any questions to our Education Director Robert Prinz at robert@BikeEastBay.org.